PEBBLE BEACH, Calif. – July 26, 2016 – Automotive Fine Arts Society (AFAS) member David Chapple will display his new sculpture tables and benches at the 2016 Pebble Beach Concours d’Elegance® on Sunday, Aug. 21, from 9:00 a.m. to 4:30 p.m. His pieces will be part of an exhibit sponsored by The Lincoln Motor Company on the 18th fairway of Pebble Beach Golf Links in beautiful Pebble Beach, California. Chapple is known for his hand-crafted sculptures, use of brilliant colors and surreal ambiance. His uniquely stylized art pieces on display at Pebble Beach, will highlight the Ferrari’s bold lines and dynamic design. 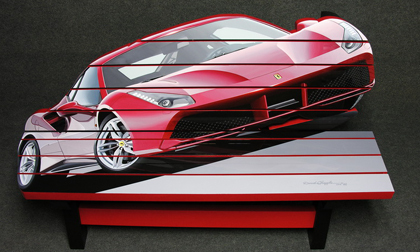 Chapple’s sculpture table entitled “Kickin”, is based on his passion for Ferrari and features the iconic prancing horse. This one-of-one original is hand-crafted out of high-density board and painted using bold colors that make the table stand out. Chapple’s table “Need for Speed” depicts an iconic Ferrari F1 car. Consistent with his other sculptures, Chapple hand-cuts high-density board to create thrilling angles and bold colors that bring his artwork to life. Each section is sculpted and painted by hand. To add another layer of dimension, Chapple also uses a clear coat process to give his work a 3D effect. In addition to his tables, Chapple will also display his latest custom bench, titled “Ferrari”. Featuring the iconic Ferrari 488, this one-of-one original is crafted out of solid wood supports that have been hand painted and sealed to deliver a truly electrifying look. David Chapple graduated from Hope College with a Bachelor’s Degree in Fine Arts in 1991 and then continued on an artistic path. His paintings are recognized for brilliant colors, three dimensional perception and bold lines. His has been displayed in national galleries with numerous paintings in private and museum collections including The Gilmore Car Museum. Art museum exhibitions to date are Krasl Art Center in St. Joseph, Michigan and Dennos Museum Center, Traverse City, Michigan. Chapple’s consours invitations include Pebble Beach, Meadow Brook Concours d’Elegance of America at St. John’s, Amelia Island Glenmoor Gathering, CCCA’s Grand Experience, Dayton, Indianapolis and Ault Park Concours. His awards include the Passion of Motoring Award at the Meadow Brook Concours d’ Elegance, Best Essence of Speed at the Glenmoor Gathering, and the Chairman’s Award at the CCCA’s Grand Experience. David has also received extensive best of show and merit awards from national fine art fairs. For information about David Chapple’s art, visit www.autoart.com.